This article is about Sheik's appearance in Super Smash Bros. Ultimate. For the character in other contexts, see Sheik. Sheik (シーク, Sheik) is a playable character in Super Smash Bros. Ultimate. She was officially confirmed on June 12th, 2018 alongside Zelda and the rest of the returning roster. Sheik is classified as fighter #16. Sheik is now voiced by Ayumi Fujimura, who voices her alter-ego in both The Legend of Zelda: A Link Between Worlds and Ultimate. Play VS. matches, with Sheik being the 47th character to be unlocked. Clear Classic Mode with Donkey Kong or any character in his unlock tree, being the fifth character unlocked after King Dedede. Have Sheik join the player's party in World of Light. With the exception of the third method, Sheik must then be defeated on Gerudo Valley. Like most Top-Tier characters, Sheik in Smash 4 was considered one of the most potent characters (and the best character in the game during the middle of the game's lifetime), due to her nearly uncontested neutral game. Despite receiving the most nerfs from game updates, she remained a Top-Tier character. Possibly as a result, Sheik has been significantly nerfed overall in the transition from Smash 4 to Ultimate. Sheik's most notable nerfs are to her already below-average damage racking ability, with her main combo moves like her tilts, neutral aerial and forward aerial, in addition to Needle Storm and Bouncing Fish, all dealing less damage. This requires her to string even more hits in order to rack up notable amounts of damage, exacerbated by her lack of KO ability. Furthermore, Ultimate's faster launch physics, jostling mechanic (which pushes opponents away), and re-addition of directional air dodges hinder many of Sheik's combo strings and KO setups. Her already poor survivability has also been worsened, due to her weight being decreased, and although the weakening of rage makes her combos more consistent, it gives her more difficulty KOing at high percentages. Lastly, while Sheik does benefit from the universally faster jumpsquats and lower landing lag like the rest of the cast, the universal changes have overall indirectly nerfed her, as she already had the overall fastest frame data in Smash 4, and most other characters have received more significant buffs in those aspects, allowing more characters to keep up with her. Sheik did receive some buffs besides universal changes. Her rapid jab connects much more reliably and its finisher has less ending lag, making it more effective for damage racking despite its individual hits dealing less damage. Her up tilt, down tilt and Needle Storm (especially the aerial version) also have less ending lag, improving their combo potential, while her generally least used moves in Smash 4 such as her dash attack, down smash, down aerial, and up throw deal more damage. Most notably, however, her back aerial deals more damage and knockback, improving its previously lacking KO potential when sweetspotted (though it is still a relatively weak aerial), and her pummel has gone from one of the slowest to one of the fastest, allowing it to be used more safely. Overall, Sheik's nerfs drastically outweigh her buffs, as the former have exacerbated her main flaws, while the latter were not significant enough to compensate, making her worse than her Smash 4 iteration. Her overall perception has been extremely negative, as many top players such as ZeRo, ESAM, MkLeo and Dabuz have claimed that she is not a viable character, since she has to work notoriously harder to rack up damage and score KOs than the vast majority of the cast. As such, her current representation in Ultimate has been poor, with many notable players such as Vinnie, Mr. R, and VoiD dropping her in favor of other characters. Sheik's design is based on the Sheikah Set from The Legend of Zelda: Breath of the Wild, including the long white scarf of the Stealth Mask. Sheik's color scheme is more subdued, and her hair features simple detailing similar to Brawl. Sheik is more vocal. She now vocalizes when using Vanish and Bouncing Fish. Like all characters, Sheik's jumpsquat animation takes 3 frames to complete (down from 4). Sheik's initial dash speed (1.7 → 2.178) and run speed (2.016 → 2.42) are faster. Sheik's air speed is faster (1.1 → 1.155). Sheik's weight has been decreased (81 → 78), now being lighter than Kirby. This further worsens her endurance, but makes her less susceptible to combos. Sheik's traction is higher (0.06 → 0.106). Forward roll has less ending lag (FAF 28 → 27). Forward roll grants less intangibility (frames 4-15 → 4-12). Back roll grants less intangibility (frames 4-15 → 4-14) and has more ending lag (FAF 28 → 33). Air dodge has significantly more ending lag (FAF 31 → 45). The removal of perfect pivoting hinders her ground mobility, worsens Needle Storm's mindgame potential, and makes her worse at extending combos. The first and second hits, as well as the neutral infinite, have altered angles and knockback to keep opponents close to Sheik, akin to other neutral attacks. This allows them to connect better and jab lock. The neutral infinite also comes out faster (frame 9 → 5) and deals drastically less hitlag, allowing it to connect more reliably from the second hit and making it harder to escape. However, this worsens Sheik's guaranteed jab cancel setups with the first and second hits, which played a large part in the utility of her neutral attack in Smash 4. The neutral infinite's finisher has less ending lag (FAF 53 → 36), no longer being the slowest in the game. All hits except the first deal less damage (3% → 1.6% (hit 2), 0.8%/0.6% → 0.3% (infinite), 3% → 2% (finisher)). The finisher's knockback was not compensated, and so it deals less knockback. Forward tilt deals less damage (4% → 3%), with knockback compensated. Up tilt has less ending lag (FAF 36 → 33). The second hit comes out faster (frame 19 → 17), allowing it to connect better from the first hit. Both hits deal less damage (5% → 3% (hit 1), 6% → 4% (hit 2)). However the knockback was not fully compensated, thus improving the second hit's combo potential. The first hit is harder to connect against grounded opponents, due to characters no longer being able to walk or run through each other, and the hitbox being moved. Up tilt has an altered animation where Sheik's heel hits the ground, bearing a closer resemblance Samus's up tilt. Down tilt has less ending lag (FAF 30 → 27), improving its combo potential. It deals less damage (5% → 4.5%). However, this also allows it to combo for longer. Dash attack has less ending lag (FAF 41 → 35). It deals more damage (6.5% → 7% (clean), 4.5% → 5% (late)) without compensation on knockback, improving its KO potential. Forward smash has less ending lag (FAF 51 → 45). The second hit comes out faster (frame 26 → 20), allowing it to connect better from the first hit. Down smash has less ending lag (FAF 55 → 52). The first hit deals more damage (3% → 4%). The second hit launches at a lower angle (48 → 43), improving its KO potential. Down smash's hits connects more reliably. All aerials have less landing lag (10 frames → 6 (neutral), 10 frames → 5 (forward), 12 frames → 7 (back), 21 frames → 13 (up), 30 frames → 22 (down)). Neutral aerial deals less damage (8%/7% → 6%/5% (clean), 5%/4% → 4%/3% (late)), with knockback compensated on the clean hit. The late hit has increased knockback, hindering its combo potential at higher percents. Sheik can grab ledges faster after using forward aerial (88 frames → 59). Forward aerial deals less damage (4.3%/5% → 3.8%/4.5%), with knockback compensated, being the least damaging forward aerial in the game. Back aerial deals more damage (7%/8% → 7.5%/9.5% (clean), 5% → 6% (late)). It deals considerably more knockback, with the clean hit's sweetspot now KOing middleweights at around 175% from the center of most stages, compared to being unable to KO under 200% in Smash 4. Up aerial's looping hits deal less hitlag, making them harder to SDI out of. Down aerial deals more damage (8% → 10%). The landing hit has increased base knockback. All grabs have more ending lag (FAF 28 → 37 (standing), 35 → 45 (dash), 33 → 40 (pivot)). Dash and pivot grab have more startup (frame 8 → 9 (dash), 9 → 11 (pivot)). Sheik has a new pummel, a knee strike rather than an elbow jab. It deals more hitlag (5 frames → 11), but has significantly less startup (frame 9 → 1) and ending lag (FAF 24 → 6), shortening its duration. This makes it more reliable for racking up damage, now being one of the fastest pummels in the game. It deals much less damage (3.1% → 1%). Up throw deals more damage (2% → 3% (throw), 5% → 6% (total)). Up throw deals more knockback, diminishing its 50/50 setups while not granting it KO potential. Down throw has decreased knockback, improving its combo potential. Needle Storm's charge can be canceled by jumping or spot dodging. It has less ending lag (1-5 needles/6 needles: FAF 48/54 → 42/49), allowing for better followups with the aerial version. The clean hit lasts longer, with the late hit having a shorter duration instead (frames 1-3/4-10 → 1-5/6-10). It deals less damage per needle (1.9% → 1.5% (clean), 1.2% → 0.8% (late)). Its charge can no longer be canceled immediately by rolling, instead incurring 4 frames of lag beforehand. The flight trajectory of aerial needles has been altered from approximately a 45° angle to a shallower 30° angle. This makes them worse as a followup from aerials at lower percents, but better at higher percents. Sheik can throw the needles with the attack button while charging. After charging the move, Sheik holds the produced needles on one hand until they are fired. Burst Grenade no longer leaves Sheik helpless in the air. It has less ending lag upon releasing the grenade. The grenade's vortex is clear/white rather than light blue. Vanish grants intangibility earlier when used on the ground (frame 19 → 14). Sheik emits a gold flash right before she disappears. After the first kick of Bouncing Fish hits an opponent, successive kicks deal more damage (12% → 13%), which also improves their KO potential. It no longer grants intangibility. It has slightly more startup (frame 17 → 18). The first kick deals less damage (12% → 11%), with knockback compensated. Bouncing Fish produces a splash of water at the start. Sheik has a new Final Smash called Sheikah Dance, replacing Light Arrow. Sheik dashes forward while the Sheikah symbol flashes on-screen. If the initial attack lands, Sheik will trap the opponent in place and repeatedly slash them with her dagger before launching them away, similar to Triforce Slash. Up aerial auto-cancels earlier (frame 47 → 44), matching the move's interruptibility. Burst Grenade has less ending lag. The neutral infinite's finisher has less ending lag (FAF 42 → 36). Down tilt's tipper hitbox is easier to land. Forward aerial has more range. Needle Storm can be charged faster. Charged Needle Storm is much harder to parry, as each needle must now be manually parried as opposed to every needle after the first being automatically parried. 2% An inward knifehand strike, followed by an upward knifehand strike. When button mashed, Sheik performs a barrage of knifehand strikes, followed by a palm thrust. Cycle Kick 3% A roundhouse kick. 3% (hit 1), 4% (hit 2) Performs a stretch kick that transitions to an axe kick. 7% (clean), 5% (late) Lunges to perform an outward fanning knifehand strikes with both of her arms. 5% (hit 1), 8% (hit 2) A roundhouse kick followed by a spinning side kick. Both attacks cause Sheik to move forward. Razor Wing 15% (hit 1), 11% (hit 2) Raises her arms overhead and then quickly swings them downward to perform outward fanning knifehand strikes. There is a hitbox at Sheik's hands, just before she swings down her arms, that hit opponents above her. If close enough to a tall character, it is possible to hit with both strikes. 4% (hit 1), 6% (hit 2) A modified butterfly kick performed from the windmill (a breakdancing move). 6% (clean sweetspot), 5% (clean sourspot), 4% (late sweetspot), 3% (late sourspot) A flying kick. Hatchet 4.5% (sweetspot), 3.8% (sourspot) A lunging, downward knifehand strike. 9.5% (clean sweetspot), 7.5% (clean sourspot), 6% (late) A high-angled back kick. 1% (hits 1 - 3), 4% (hit 4) A diagonal, corkscrew flying kick. This is concluded by another kick with the opposite leg. 10% (descent), 2% (landing) A diagonal flying kick. It is a stall-then-fall, and its clean hitbox is a meteor smash during its beginning. 5% (hit), 2% (throw) The tie shan kao (a technique used in Bajiquan). 5% (hit), 2% (throw) Throws opponent behind herself and performs a mid-level side kick. 3% (hit and throw) A handstand kick. 3% (hit and throw) A collar drag takedown followed by a somersault axe kick. 9% Performs a corkscrew dropkick while climbing up. Needle Storm 1.5% (per needle, close), 0.8% (per needle, far) Accumulates up to six needles that can be thrown immediately or stored for later use. When used in the air, Sheik throws the needles downward at approximately 30°. One of Sheik's best options for camping and zoning. The needles have transcendent priority, and so cannot stop or be stopped by other attacks (including, for example, other projectiles). Burst Grenade 1% (grenade), 1% (vortex), 12.6% (explosion) Throws a grenade attached to a tripwire. On detonation, it creates a small vortex that pulls opponents towards it, then explodes. The detonation can be delayed a second by holding the special move button. The grenade can be thrown a farther when used in the air or when thrown over an edge, and its explosion is strong enough to KO middleweights at 115% near the edge, making it useful for edge-guarding. If Sheik is attacked before the grenade explodes, the grenade will detach from the tripwire and become a non-explosive item that anyone can use. Vanish 12% (disappearance), 5% (reappearance) After a short delay, Sheik destroys a Deku Nut in order to disappear via a small explosion, before reappearing nearby in a controlled direction. Its disappearing hitbox's respectable damage output and very high knockback scaling enable it to KO at 100% while near the upper blast line. It also grants a small vertical boost when used in the air. Conversely, its reappearance hitbox deals much less damage, but also has a windbox that can push away opponents who are very close to wherever Sheik reappears. It grants intangibility on frames 19-53. Reappearing near a edge renders her helpless, though self-destructing with the move is difficult to do because it allows Sheik to grab the edge the moment she enters helplessness. Bouncing Fish 11% (first kick), 13% (following kicks) A 360° Tengkong Pantui Cepu (a kick used in Nanquan). If it connects with an opponent, she will backflip a distance away and land on her feet. She can then kick up to three times by pressing the special move button again after the preceding kick connects. Upon missing, she experiences landing lag if she lands before the move's animation is over. It can also be executed earlier by pressing the special button again, and covers more distance if the control stick is held in whatever direction Sheik is facing. Its long horizontal travel distance, respectable damage output, and high knockback scaling make it one of Sheik's most viable KOing options. It KOs middleweights at 120% while near the edge, and grants intangibility on frames 3-4. Due to its earliest input hitting on frame 17 and its landing lag, however, it is punishable if it misses. Sheikah Dance 3% (first hit), 2% (first hit, late), 50% (entire move) Sheik dashes forward and slashes with her knife. If she catches anyone, the Sheikah eye symbol will appear onscreen, and the screen will darken. She will then proceed to launch an onslaught of attacks from multiple directions before finally launching the trapped opponent with a final slash. The last hit of her Final Smash launches opponents the opposite direction of the initial dash. Only one opponent can be trapped in her Final Smash, though anyone nearby will also take damage during the duration. Kicks once (similar to her forward tilt), spins on the ground (similar to her down smash), then poses with her arms bent across her body. Crouches, swipes with her hand twice, then stands up while rearing back her right hand up to her face. Performs the fumikomi geri (a stomp-style kick in karate), followed by a mid-level side kick, and then exhales loudly before performing the tate shuto uke (a blocking technique in Shotokan). Sheik's opponents are characters who wear masks or other forms of headwear to conceal their identity. 5 Little Mac Boxing Ring Tunnel Scene - X-Scape Little Mac is in his wireframe with hoodie costume. 6 Mii Fighter Team Final Destination Meta Crystal The Mii Fighters are all wearing masks or helmets. Items are absent. Although Sheik does not appear in the World of Light opening cutscene, she was vaporized and later imprisoned alongside the rest of the fighters (sans Kirby) when Galeem unleashed his beams of light. During the mode itself, Sheik can be unlocked early on shortly after rescuing Mario, where the player arrives at a crossroads and has the choice to rescue her, Marth or Villager. If one of the others is rescued first, Sheik's path will be blocked by a force field created by Master Hand, which will disappear upon defeating a boss or can be circumvented by looping back to the other side. Sheik has a separate awakening battle from Zelda, who appears in the opening cutscene. Sheik's Fighter Spirit can be obtained by completing Classic Mode. It is also available periodically for purchase in the shop for 500 coins. Unlocking Sheik in World of Light allows the player to preview the spirit below in the Spirit List under the name "???". As a Fighter Spirit, it cannot be used in Spirit Battles and is purely aesthetic. Each Fighter Spirit has an alternate version that replaces them with their artwork in Ultimate. Fighting Wii Fit Trainer on Coliseum. Surrounded by the fires on Kalos Pokémon League. Sheik performing Bouncing Fish near a Goldeen on Tortimer Island. Sheik and Ivysaur taunting on Tomodachi Life. Sheik and King Dedede hit by Mr. Game & Watch's down smash on Yoshi's Story. Sheik getting hit by Toad's spores on Tortimer Island. Sheik becoming buried by the male Wii Fit Trainer's neutral attack on 3D Land. Sheik getting hit by Zero Suit Samus's back aerial on Luigi's Mansion. Sheik charging Needle Storm on Tortimer Island. 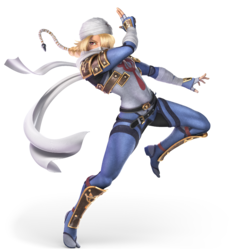 Sheik is currently referred to with male pronouns on the Smash Blog  despite being referred to with female pronouns in every Smash appearance thus far, as well as on various other official Nintendo social websites. Likewise, the game itself uses both female and male pronouns: Sheik is referred to with female pronouns in her moveset and tips, while Palutena and Viridi refer to Sheik with male pronouns in Palutena's Guidance, albeit in the latter instance is done for comedic purposes as Pit then mentions her being an alter-ego of Zelda. Ultimate is the first Smash game where Sheik's design is based off of a different The Legend of Zelda game than her alter-ego, Zelda. Ultimate is also the first installment in the series that gives Sheik a Final Smash different from Zelda's. Like in the previous installment, Sheik will revert to her Brawl idle animation while holding a small throwable item. In Palutena's Guidance, Sheik is referred to in the sense of having been present before in Smash 4 ("Sheik appears to be wearing a traditional Sheikah outfit this time around. "), despite every other newly recorded Zelda character guidance bringing up the characters having separate incarnations throughout the franchise (Ganondorf being the same person, Link being a different person than before and Zelda and Young Link being specific incarnations). This implies that she's the same version of Zelda/Sheik seen in Brawl and Smash 4 that was based upon the design made during the development of Twilight Princess for Brawl. 1. ^ translates to "Applying Mountain Lean"
2. ^ translates to "Vacant Cross-Legged Side Flip"
3. ^ translates to "Stomping Kick"
4. ^ translates to "Vertical Knife Hand Block"
↑ "Usage of Male Pronouns on Official SSBU Website. ↑ "Usage of Female Pronouns on Official Nintendo Tumblr. ↑ "Usage of Female Pronouns on Official NintendoVS Twitter. ↑ "Usage of Female Pronouns on Official Nintendo Switch News Feed, screenshot posted on Twitter.